Amandé Guesthouse is situated in an up-market and tranquil suburb adjacent to the Centurion CBD, Supersport Park, Highveld Techno Park, Midrand and Pretoria-central. 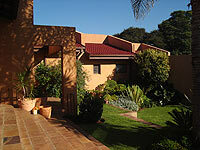 English and/or continental breakfasts are served on the patio overlooking a beautiful garden and fishpond. Access to the N1, N14/R28 and R21 highways are quick and easy. Half an hour's drive from O.T International Airport and Johannesburg CBD - 15 minutes drive from Midrand, Lanseria and Pretoria CBD. Supersport Park is within walking distance and Techno Highveld Park just across the highway. Amandé Guesthouse is situated within a closed boom-controlled security area of which the streets are patrolled at night. Amandé Guesthouse offers uniquely decorated and separated apartments with private entrances and en-suite bathrooms, as well as self catering units that can accommodate up to 6 guests. The bride-to-be and her entourage can also ideally overnight and have all the necessary pampering done in this cozy setup with it's private built-in braai facility and outside entertainment area set amongst a French garden and fishpond. All rooms are serviced daily and fully equipped with a TV, refrigerator and tea/coffee making facilities, etc. Vehicles are parked on the premises behind remote controlled security gates. Airport-transfers as well as a shuttle service to and from venues can be arranged. Wireless Internet access available.